Correct me if I am wrong, but I believe that if a novel with your name on it is spotted in a bookshop, you can safely call yourself an author. Categories: Balthasars Vermaechtnis, Happiness, The Novel | Permalink. I’m still unpacking boxes but am gloriously happy in my new home. Living without a kitchen is interesting, but since I was the one who sold the concept to my family as a big adventure, I’m not allowed to complain. Let’s just say that once the cooking on camping plates and the washing up in the bath comes to an end, I’ll be even happier than I am now. Fit to burst happy. Disgustingly, floating on air happy. 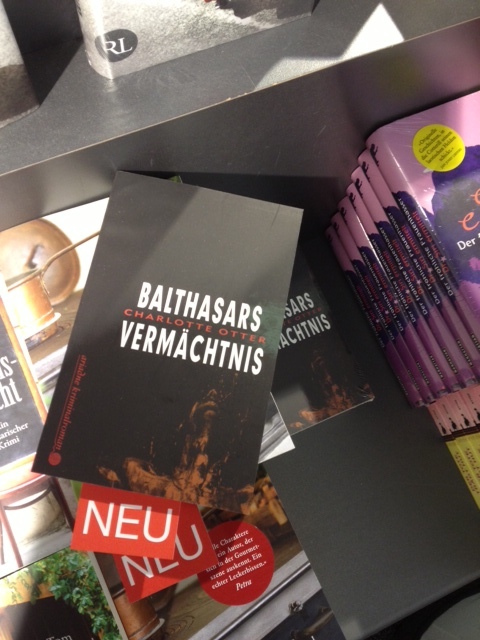 I had more happy news about Balthasar’s Gift. My agent M works with a fabulous London literary agency who sell her books in the British market, and she sells theirs in the German market. A couple of agents read BG over Christmas and reportedly ‘loved it.’ They have asked for some revisions and after a call with them next week, I will be getting to it. This is the third set of agent revisions I will have done since August last year. The road to publication is not easy! And ’tis filled with revisions! However, I can see BG getting stronger and stronger and that makes me – you guessed it – happy. Categories: 2011 Goals, fiction, Happiness, Life in Heidelberg, The Novel, Writing | Tags: fiction, literary agents, Writing | Permalink. This post is not about diamonds, though I am not above them. It’s about a scattering of small things that are bringing me joy right now. I only have to pick up one of them and consider its sparkle for a short moment to have a flash of happiness run through me. Let me elaborate. I have just finished reading Maggie O’ Farrell’s The Vanishing Act of Esme Lennox. It is a perfect book, neither too long nor too short. It’s a delicate balance of flavours that sit gently on the palate, never hitting a strident note. Not too say it’s genteel, because it isn’t, but it’s subtle, disturbing and lovely. A gourmet meal of a book, that leaves you sated but not crammed. I finished my novel on Sunday. That would be finished again, for the third time, now with comments from beta readers. I have some further outlying beta readers who I may still need to canvass, but right now it’s being read by a friend of mine who’s a talent scout. I also pinged a partial to a literary agent and please hope along with me that I was not being premature. The sparkle in this case is the feeling that my baby is out there, trying to stand on its own two feet. Two blog pals and I are working on reinvigorating our blogs. We are all veterans now and are putting our head together to think about ways to rejuvenate and find the joy in blogging again. Watch this space! There are changes afoot. A wonderful graphic designer is helping me design a professional writing website (different from this blog and my putative author’s website). It’s time to put my business card out there. She has recommended that I have a business blog and I would relish ideas for topics from you clever lot. What would a freelance writer writing in English but living in Germany want to write about? One idea I thought of was how writing a novel has affected my business writing (a lot, I can tell you, especially this revision phase). I found this website and this one, both full of quirky travel options. There I found Camping Les Ormes and I’ve just booked a week’s holiday for my family in a Kalahari safari tent. It’s in the Dordogne, so we won’t hear any lions roaring at night nor will we have monkeys stealing our food, but it’s a thrill. And so pretty. The Orange long list is out today. That’s 20 new books by twenty fabulous female writers that I can put on my wish list. I’ve read Wolf Hall and The Help, so make that eighteen, but still! I bought new black sunglasses and am walking around feeling like I have a new angle on the world. Feeling rather film noir, I must say, but in a good way. In three weeks I go to Prague with my oldest and dearest friends, K and D.
It’s about to be spring. The Burg burnt the snowman on Sunday and what the Burg says, goes. Wishing you happy Spring! May your lives be filled with glittery things. Categories: Freelancing, Happiness, Reading, The Novel, Writing | Permalink. Tomorrow we celebrate 15 years of marriage and to celebrate, I’m breaking with the memoir theme to give you Fifteen Things I Love About My Husband. 1. Makes me laugh, and finds me funny. 2. Buys cleaning products, and uses them. 3. Is co-dependent in the book habit. 4. Not scared of the gory jobs – anything to do with toilets, vomit, dead animals, he’s the one. 5. Let me win at Scrabble twice this week. 6. Cherishes our family life. 7. Loves and keeps up with his friends. 8. Found me at least eight of my best girlfriends. 10. Makes a salad with as much flair as he cooks a steak. 11. Does all the crafting so that I don’t have to. 12. Is a wonderful mixture of dreamy and practical. 13. Recovered our dining-room chairs in three hours last weekend. 14. Has to leave the room during key scenes of The Office. 15. Is more hot and handsome than he was when we got married. I love you my darling. Thanks for all the years. You are my one and only. Categories: Happiness, Love, Marriage | Tags: Alphabet, Things I love about my husband | Permalink. The first to guess correctly and post their answer in the comments will receive a complementary package of Lindt chocolate from me, sent to anywhere in the world in time for Christmas. Categories: Concerts, Happiness, Live in concert, Live music | Tags: Eighties nostalgia, Kim Wilde, Tears for Fears | Permalink. I plan to read, write, swim, run, eat, drink, dream and enjoy some sunshine with my family. On my return, I hope to be a better blogger. Wishing you all sun and happiness in my absence. Categories: Happiness, Holidays, Italy, Travel | Permalink.